Now I know I have written about Atlanta in the past but just seems to me like I keep passing through this great city. Maybe that’s because so many roads pass through it that you can’t help but get a glimpse of the place whenever you visit the south… which happens to be my home. So I guess there is good reason for them to call it the “Gateway to the South,” I couldn’t have put it any better myself. Anyway this time on my way home from business I was driving a Chevy Aveo that I had rented before landing. They had a deal where you could save fifty bucks on the rental car if you rented it from the airport. I don’t have to say it because you already know but I found that great discount on RentalCarMomma.com’s website. Anyway as I was passing through Atlanta the sun started to go down. With almost eight more hours of driving to go I figured it would be best to take a rest and spend the night there. Well when I woke up in the morning it was ten o’clock, I had really made no effort to get out of bed so I decided I would do something in the city before heading home. I heard about this really great place that pays tribute to the civil war. If you aren’t a history buff then you don’t know that Atlanta was pretty much wiped out during the Civil War, so you can find historical monuments and memorials just about everywhere you look here. But this particular place is known as the Atlanta Cyclorama. You sit in the middle of a room and a stage surrounds you. When they start it up the stage starts to rotate and you get to see this incredible panorama of the war. In order to bring the war to life they use sound, music and these incredible hand made soldiers. They are like life sized dolls that were carefully made to depict the war. Anyhow the Cyclorama was a really short experience, but it was really fun to check out to. Of course there were lots of souvenirs to buy afterwards, so I took some things home for the family. 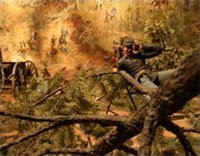 If you got some free time on your hands in Atlanta be sure to visit the Cyclorama, it was well worth it.